ATM Security & Fraud Prevention: ATM Gas attacks are a problem for Europe - Is the USA next? ATM Gas attacks are a problem for Europe - Is the USA next? In April 2013 information of the first ATM explosive gas attack seen in the UK was posted on this blog. 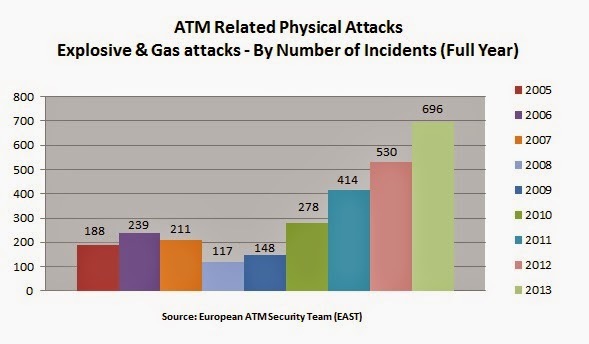 The European ATM Security Team (EAST) has been reporting statistics for such attacks since 2005, and the chart below shows a significant increase from 2009 to 2013. Since April 2013 over 90 gas attacks have been reported in the UK alone. On 27 January 2015 an article on ATM gas attacks was published by Bloomberg - giving excellent detail on the UK problem and wondering if the USA might be next? In May 2014 EAST launched a new Expert Group, the EAST Expert Group on ATM Physical Attacks (EGAP) and EGAP is giving special focus to the gas attack problem. In November 2014 EAST upgraded their website and in April of this year the Group will publish updated fraud and crime statistics covering the full year 2014. How to protect your PIN.....by being creative! For high level specialist management support with an international reach. © BenAlpin Ltd 2011. Awesome Inc. theme. Powered by Blogger.